I’ve finally reached the point where I think it’s worth me starting a bit of a ‘Hall of shame’ for some of the worst examples of information design (or more likely, the lack of it) I come across. I realise it puts me in the same category as the angry writers who berate every grammatical error they come across. I hope though, I can use a bit of my knowledge to explain where I think these items fail – in a similar vein to fit to print’s grammar nanny not grammar nazi plea. The very short version of what I’m being told is that at some point I’m going to need to create what is, basically, a second password. That’s fine, happy to do that, but I don’t need the best part of 4 sides of A4 to tell me that. In fact, the letter is entirely redundant. I’m sure it’s an attempt at the personal approach, and to let me know they’re sorry for the inconvenience it will cause me (although I’m told it’s a simple process). Actually, more inconvenience will be caused by reading through both documents. And I’m certain it will take me longer to read them than it will to make the change when it’s needed. This isn’t a repeat of the point about how much text is used, it’s a more obvious point. 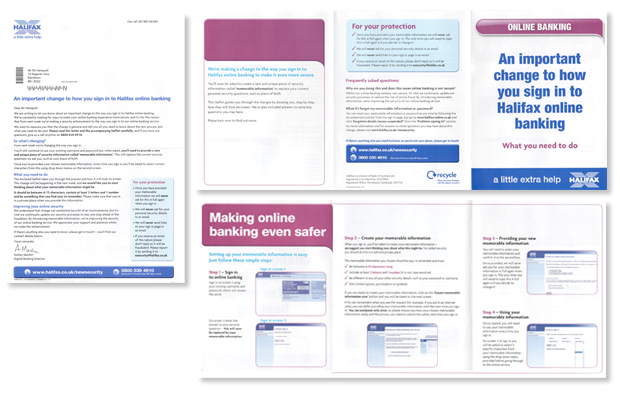 This is about online banking, you know, on the internet, on a screen. So why not deliver this information to me on the internet, on a screen? I can’t actually do anything about this matter till I go online. Nice as the advance notice is, an email would have been fine. If you’ve come across anything else like this that you think deserves to be part of the hall of shame, let me know. This is truly a terrible example of information design. I too find a lot of letters seem to be over complicated to say something that can be summarised in one line or at most a single paragraph. Recently having cancelled a holiday due to a family death I had to provide all documentation I had recieved from my Travel Agent. They sent me a Cancellation Invoice also, but every letter I had received contained all their terms and conditions as well as every single detail about the holiday and possible extras I may be interested in. I must have had about 30+ pages to send then in the end as evidence I had booked the holiday, bought insurance and had cancelled it. I think companies find themselves stuck between a rock and a hard place on these matters. They feel compelled to provide T&Cs every time so they know you have a copy to refer to at each stage of the process, but as you say the amount becomes absurd. Their alternative is to refer customers to another resource, the original *see website for details, which leaves them open to accusations of a lack of transparency. From my point of view, the problem is actually the amount of detail they provide each time. Presumably the T&Cs you received covered situations you were never likely to encounter on that particular holiday. Everyone gets the standard set regardless of their circumstances. The back-office systems are surely up to being made intelligent enough to identify what’s relevant and just produce that. The recent ash-cloud and bankruptcy of a number of travel companies have highlighted how unaware people are of the insurance they take out, and the sheer quantity of information surely plays a large part in that. In all that information was there anything that explained to you why the second password is necessary or how it helps? I went through this online with my bank, and they never got me to understand the hwy of it. The only explanation was a cover-all statement of ‘to improve security’, which is then followed by an assurance that the system was totally secure beforehand. I have two bank accounts, and both have made this change (http://www.roberthempsall.co.uk/barclays-pinsentry-–-is-it-really-a-simpler-way-to-login/). Having followed the instructions yesterday, and had the first use of my extra password, far as I can see all it has done is to make the log in process longer, and especially fiddly on a moblie. I’m sure there are good reasons for the change, but they’re not made clear. Like any technical product though, do I really need (or want) to know the technical ins and outs? Not really, as long as it works. I guess the only difference between upgrading this bit of technology and most others, is that I have to do a bit more work.